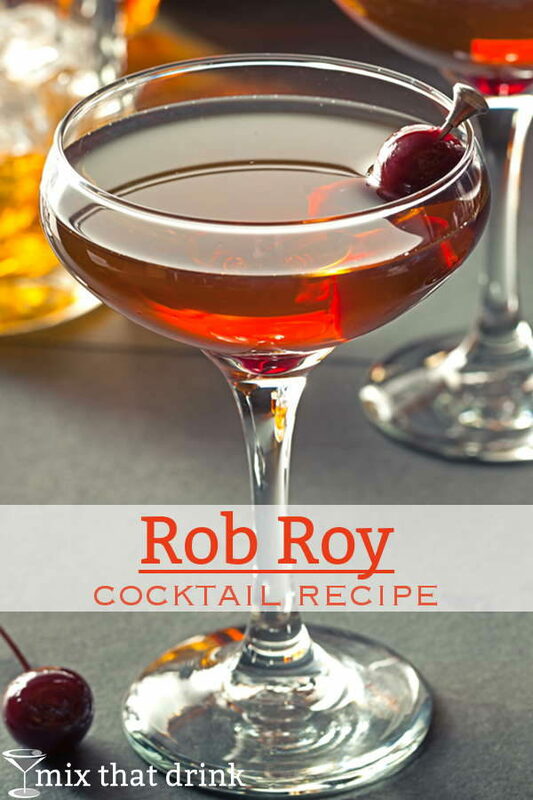 The Rob Roy is basically a Manhattan with Scotch whiskey instead of bourbon. It has the same sweet vermouth, giving it a reddish color. But while the flavor is similar to the Manhattan, it’s different enough to appreciate. With most cocktails calling for scotch, you don’t need to use a high-quality single malt. And the Rob Roy works very well with a good, drinkable blended scotch. But in this drink, the scotch flavor does come through clearly enough that you may enjoy using a top-shelf scotch in it. Whatever you choose, be sure to pick a bottle you could drink by itself or over ice. This is a nice drink to relax with at the end of a long day. It’s a little bit on the strong side, but not overpowering. The balance between sweetness and smokiness is easy on the palate. The Rob Roy is a Manhattan with scotch instead of bourbon. It's similar enough that if you like the one, you will probably like the other. But it has a distinct taste of its own that scotch lovers will treasure. Fill a mixing glass with cracked ice, and add your liquors to it. I first had one of these in college and I’ve been drinking them ever since.